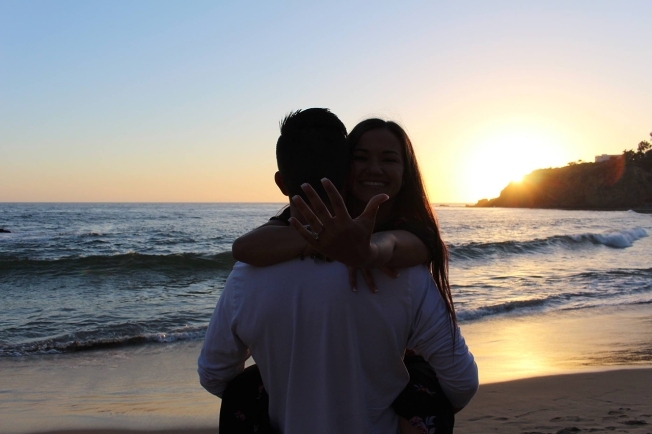 Mykenzie Lane, 22, shows off her engagement ring with her boyfriend, 21-year-old Brandon Helmick. The pair were victims of the Las Vegas mass shooting on Oct. 1, 2017. Two people who survived the most terrifying moment of their lives are now celebrating one of the most joyful. Orange County residents Mykenzie Lane, 22, and boyfriend Brandon Helmick, 21, were victims of the mass shooting in Las Vegas on Oct. 1, 2017, where a gunman opened fire on a crowd of concertgoers at the Route 91 Harvest music festival. The shooting left 58 dead and wounded hundreds of others. Lane was hit by a bullet that night and she’s alive today because Helmick used his body to shield her. Helmick proposed to Lane on Friday -- proving that he really is her knight in shining armor. The couple has been together for 3 years, Lane said. And, they’ve already set a date: August 3.